Myopia, also known as nearsightedness, is a condition of the eye which causes distant objects to appear blurry. The term nearsightedness is a bit counterintuitive as it means that you CAN see near objects clearly, but distant objects are blurry. 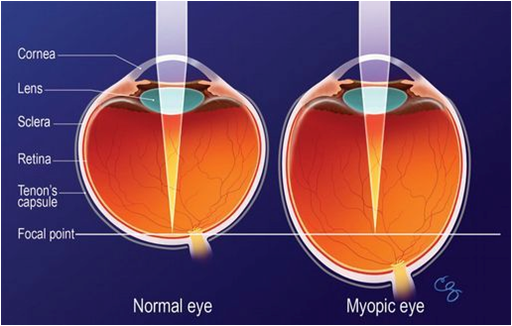 In order to understand myopia, it’s helpful to know a little bit about the anatomy of the eye and the visual system. When you look at an object, light rays from that object enter your eye through the cornea and other refractive components of the eye, such as the natural crystalline lens, and eventually reach the back of the eye. In a normal sighted eye, one that can see 20/20 in the distance without any spectacle (glasses) or contact lens correction, the light rays from that object will come to a focal point directly on the retina, producing a clear image. In an eye that is nearsighted, those same light rays will fall short of reaching the retina, which produces a blurry image. (See Diagram 1 below) This is typically due to the fact that some eyes are anatomically longer in nearsighted eyes when compared to normal or farsighted eyes, so the light rays have farther to travel. The different refractive structures in the eye, including the cornea and the natural crystalline lens of the eye, also play a role in nearsightedness. 2. Contact Lenses: The only difference between eyeglasses and contact lenses is that the contact lens is placed directly on the cornea. Otherwise, the same principles apply. For nearsighted correction, the contact lens will also be a concave lens and will work in the same way to refocus those light rays from an object to a focal point directly on the retina to produce a clear image. 3. Vision Correction Surgery: Although there are many different types of vision correction surgery that can correct nearsightedness, this blog will be limited to the two most popular procedures which Dr. Mandel specializes in: LASIK eye surgery and PRK eye surgery. Both procedures work the same way to correct nearsightedness. One of the key differences between LASIK and PRK surgery is that one employs a corneal flap and one doesn’t. Click here to learn more about the differences between LASIK and PRK. We’ve already established that the main cause of nearsightedness is that the light rays from an object fall short of the retina. 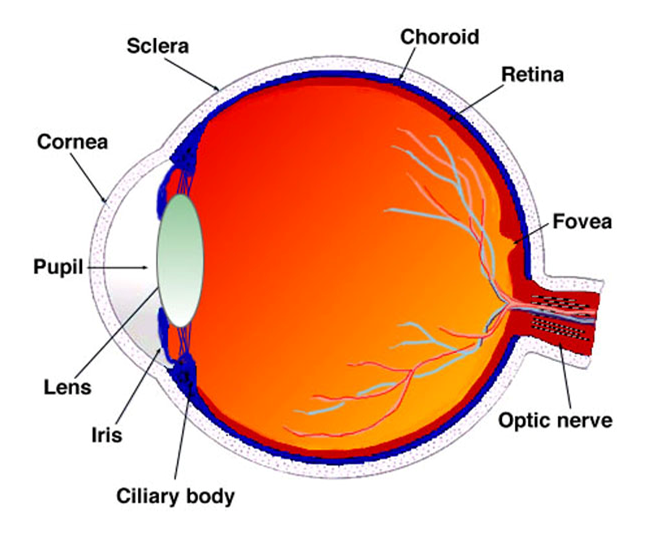 Although we can’t shorten the eye, we can lengthen the distance that the light rays from that object need to travel so that they can be focused at a point directly on the retina. The way that’s accomplished with LASIK and PRK laser vision correction is to gently sculpt the cornea by removing microscopic amounts of tissue centrally, so that light rays have less corneal tissue to travel through. The amount of tissue that is removed, as well as the entire treatment, is customized for each patient by Dr. Mandel personally. Are you nearsighted? Tired of fumbling around with glasses and contact lenses on a daily basis? Want the freedom to wake up in the morning and just go, never having to think about your vision? Call us today at 888-866-3681 to schedule a free LASIK or PRK consultation with Harvard-trained corneal specialist and micro-surgeon, Dr. Eric Mandel, M.D. Or, click here to schedule your consultation online.